The overall course was very informative and helped me to get through the certification assessment without any hurdle. The course instructor KE conveyed his ideas & thoughts in a very interactive way. Overall, KnowledgeHut service & coordination were excellent and would recommend your service to my team as well. Thanks, KH! Adelaide is the cultural capital of Australia and its cosmopolitan nature makes the city one of the favored destination in the world for business and pleasure alike. Adelaide is emerging as the economic hub of South Australia and is a major contributor to the global economy. Adelaide is ideal for IT start-ups thereby creating a viable market for the hiring of highly skilled professionals looking to be a part of an exciting workplace. Business services and household services sectors are the major contributors to Adelaide's economy. Adelaide has traditionally been home to world-class business and IT schools and KnowledgeHut is bringing the same excellence to IT related online courses. KnowledgeHut has developed e-learning modules for CSD Certification in Adelaide. The Scrum framework is increasing in popularity all the over the world and prominent companies are seeking certified scrum developers. Adelaide is ideal for establishment of business centers of prominent global companies and new IT start-ups, which has created a burgeoning employment market. The CSD Training in Adelaide is suited for beginners and mid-level professionals keen on updating their knowledge in their chosen specialization. The skill-building certification provided by KnowledgeHut will definitely augment their professional skill-set and help them, stay relevant in their chosen field. Pursuing online classes in Certified Scrum Developer Training in Adelaide will guarantee that candidates emerge employment-ready and quickly become an invaluable asset to the organization. The course from KnowledgeHut comes with expert faculties and online resources are made available to students at all times. This course provides you with a competitive edge over your competition by virtue of your enhanced knowledge and skill set. 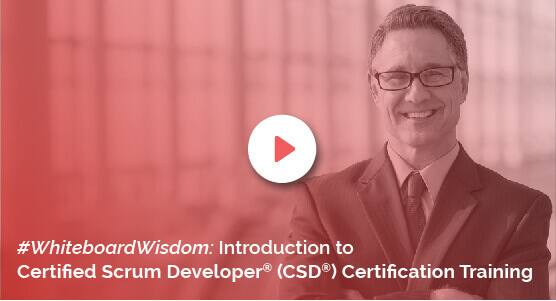 The Certified Scrum Developer Certification guarantees access to world-class training at a reasonable price. The all-encompassing syllabus from KnowledgeHut ensures that you are able to pass the exams on this subject with relative ease. Online training in CSD Course in Adelaide will increase the employability of our students and allow them to stay a step ahead of the rest.